Internal fossil fuel industry memos reveal decades of disinformation—a deliberate campaign to deceive the public that continues even today. For nearly three decades, many of the world’s largest fossil fuel companies have knowingly worked to deceive the public about the realities and risks of climate change. Their deceptive tactics are now highlighted in this set of seven “deception dossiers”—collections of internal company and trade association documents that have either been leaked to the public, come to light through lawsuits, or been disclosed through Freedom of Information (FOIA) requests. Each collection provides an illuminating inside look at this coordinated campaign of deception, an effort underwritten by ExxonMobil, Chevron, ConocoPhillips, BP, Shell, Peabody Energy, and other members of the fossil fuel industry. Containing 85 internal memos totaling more than 330 pages, the seven dossiers reveal a range of deceptive tactics deployed by the fossil fuel industry. These include forged letters to Congress, secret funding of a supposedly independent scientist, the creation of fake grassroots organizations, multiple efforts to deliberately manufacture uncertainty about climate science, and more. 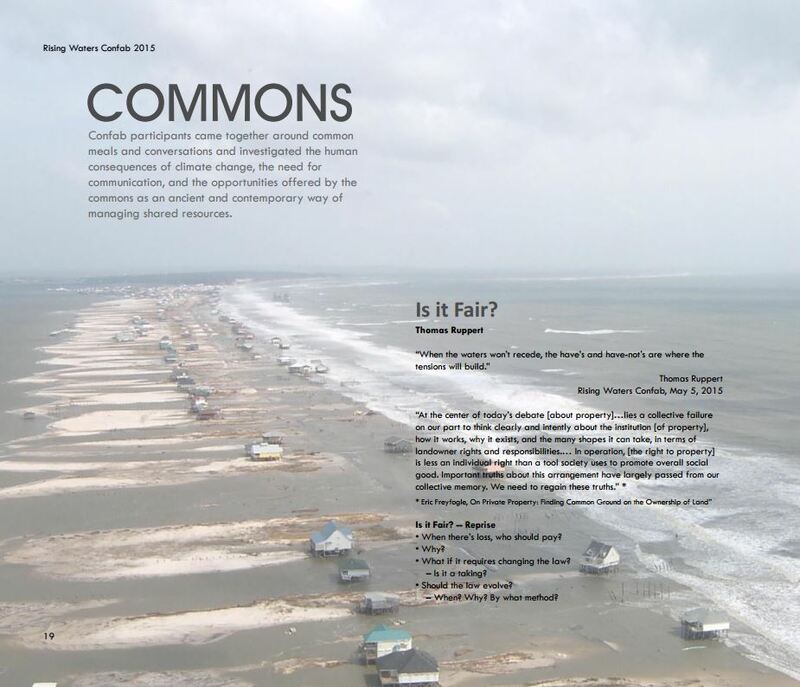 The Rising Waters Confab Report / Visual Book is complete. Click here for the document. The environmental issues facing us as a result of climate change are daunting. 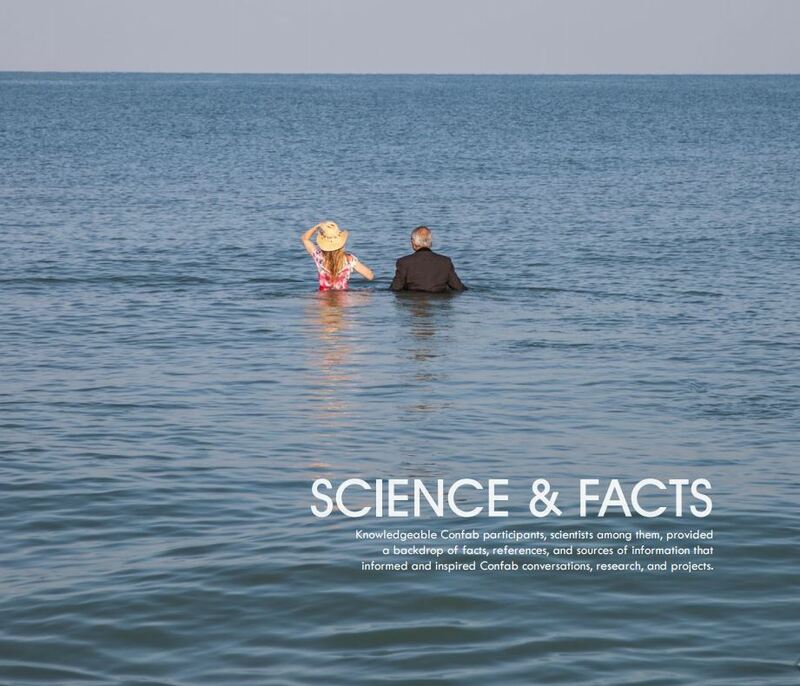 Scientists are doing important research to address the complex topics such as water supply, food access, air quality, and temperature rise that accompany global warming. Artists are in a unique position to reflect on these topics and engage people with issues that are hard to imagine because they are happening someplace else or in the future. How can these disciplines begin working together to get the interest and attention of a broad public audience? 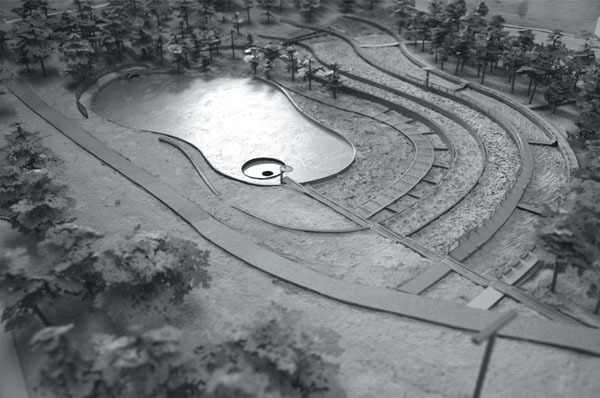 Mary Miss/City as Living Lab, Layered Pond: House Creek Basin, 2005. Courtesy Mary Miss Studio. The double helix is a compelling figure. It is an image that comes to mind in trying to conceptualize the relationship between the research of scientists and the investigations of the visual thinker, suggesting the connection and continuous movement of the shared development of ideas and the ability we may jointly have to create change. 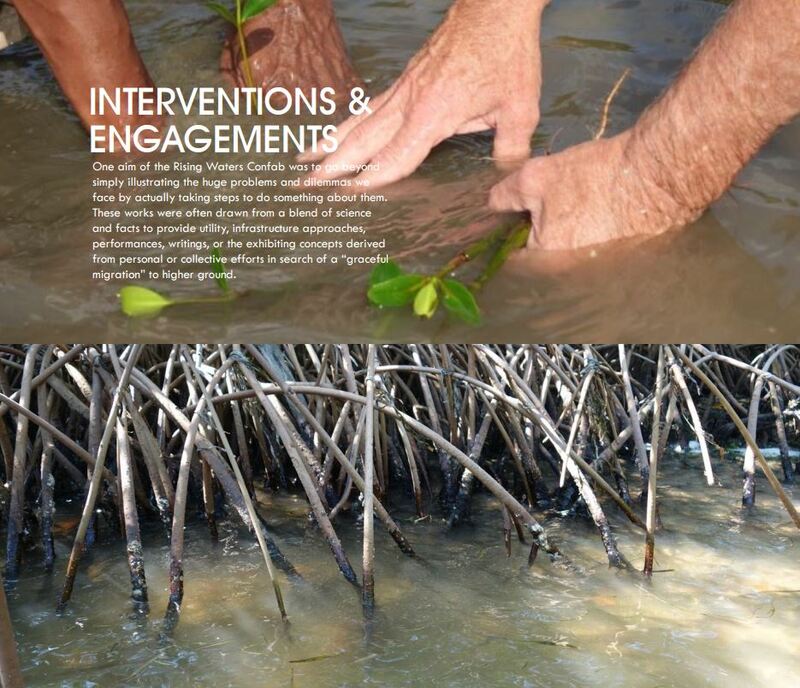 The entwined strands seem an appropriate image to describe the relationship between scientific research and the development of the means to implement and communicate these insights to the broader public. As we have entered the 21st century, it has become clear that we need to redefine how we live our lives, use our resources, communicate, educate, work, and collaborate. It is a time when the imagination and the ability to envision alternatives are our greatest resources. In recent years a number of questions have arisen for many artists: how is it possible to have a more central role in shaping or bringing attention to the important issues of our times? How can the imagination, the prime territory of artists, be used to engage the broader public? 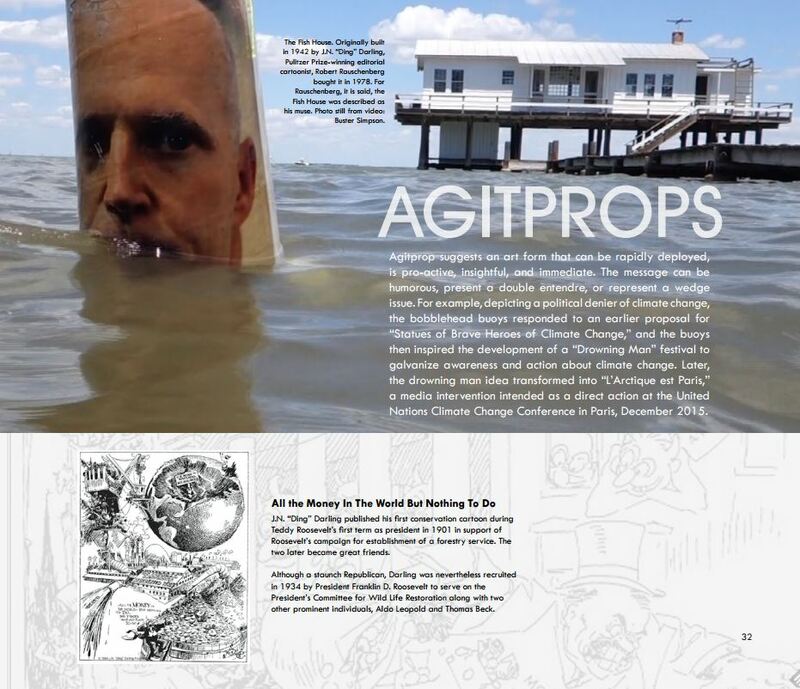 How can artists participate in communicating the importance of global ecological awareness? The task is to create new bonds and reconfigure the old ones—between the built environment and the natural world, between various communities, and between our history and current needs. However, change cannot happen without the support, understanding, and participation of the individual citizens that make up our communities. Individuals are key to creating a new paradigm for a sustainable future. The question that then arises is how citizens can gain access to the research and ideas that are currently being investigated. It is through their individual actions and by understanding that a community’s involvement is possible. Political will develops through the engagement of individuals, and change is implemented and accumulated layer upon layer from one scale to the next. For this to be possible the issues, the ideas and solutions currently being researched, must be made accessible and tangible, and offer visceral experiences. This has the potential to bring about direct engagement. But how do you bridge this gap between scientific research and public engagement? 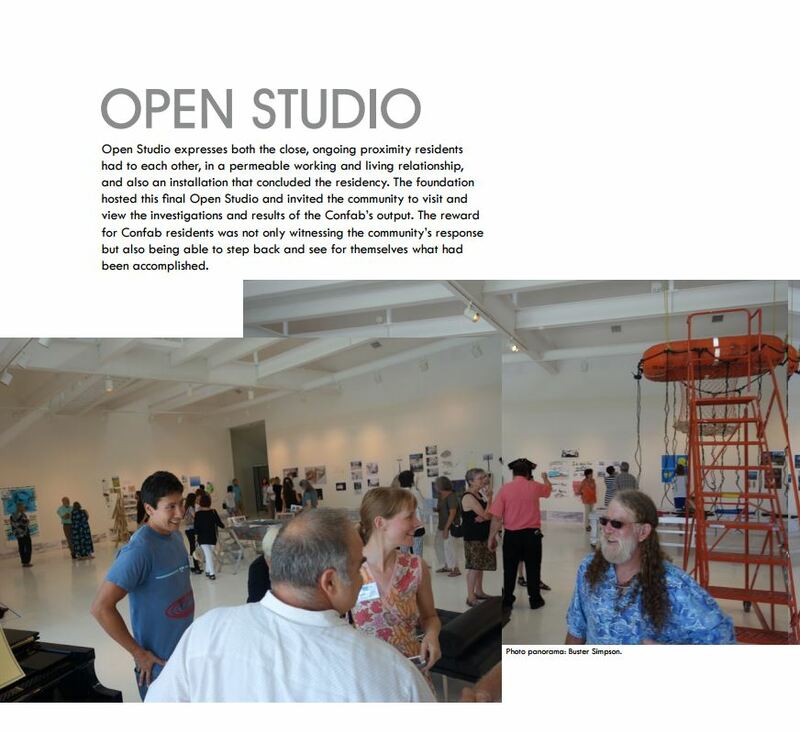 Mary Miss/City as Living Lab, STREAM / LINES, 2013–15. Indianapolis, IN. Courtesy Mary Miss Studio. Recently, artists have taken the lead in investigating new ways of imagining our cities, through multiple projects that seek to redefine the public domain. They have looked at ways to show the connection between our private lives and public actions. They have revealed layers of events to show that there is no single history of a place. There have been projects that use infrastructure such as bridges, recycling plants, canals, and sidewalks as sites of artistic intervention. In recent decades, the idea of collaboration across disciplines has been the territory of rich investigations. 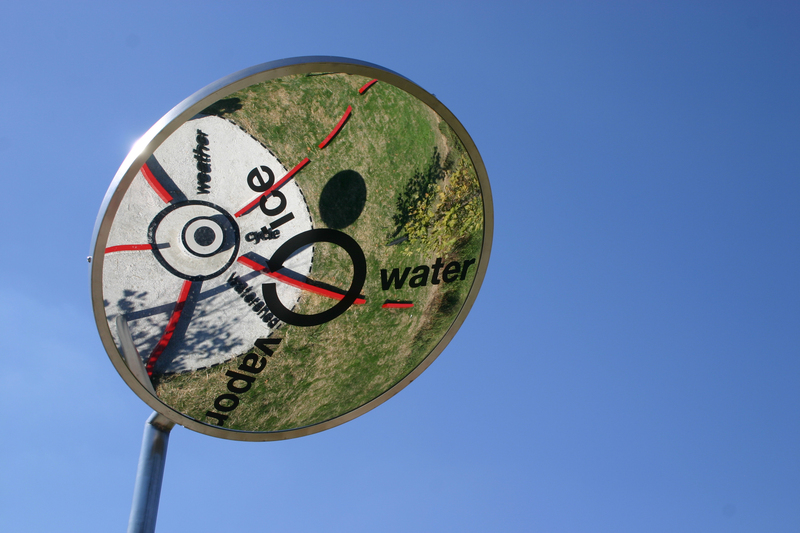 The research of hydrologists, for instance, provides greater understanding and insights into the function of groundwater systems and the treatment of urban runoff. The implementation or testing of this research is an important next step. This might be accomplished by integrating a series of test situations into a new park or wetland restoration or a street and sidewalk upgrade. However, the means to communicate this research and what has been implemented is often overlooked. At each step of this process, we must ask whether there is a way to work with visual thinkers to engage the public—the interested individual—with what may otherwise go unnoticed. 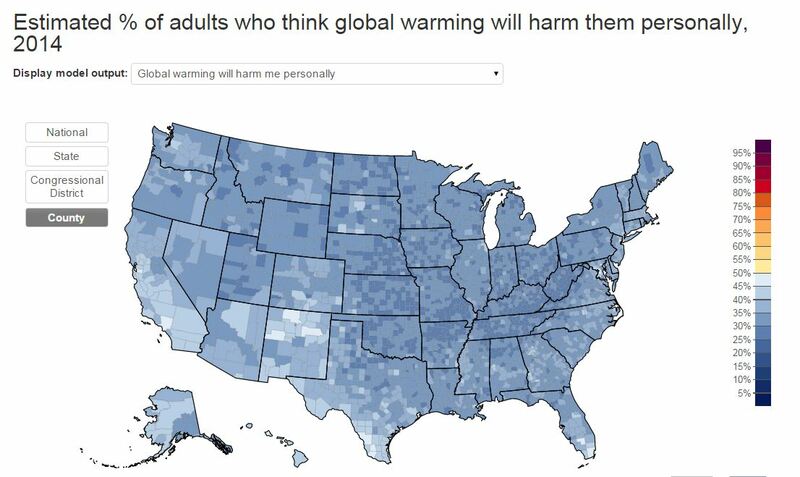 We are pleased to announce a new interactive mapping tool called “Yale Climate Opinion Maps” (YCOM) and an accompanying peer-reviewed paper in the journal Nature Climate Change. 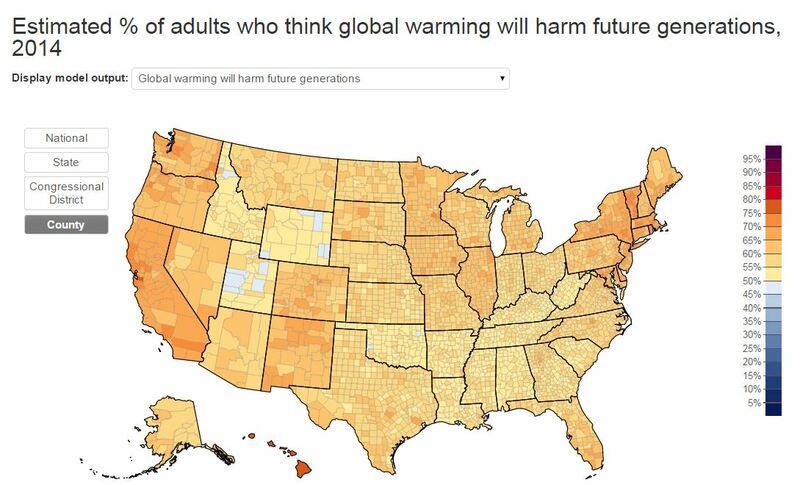 This tool allows users to visualize and explore differences in public opinion about global warming in the United States in unprecedented geographic detail. Most of the action to reduce carbon pollution and prepare for climate change impacts is happening at the state and local levels of American society. Yet elected officials, the media, educators, and advocates currently know little about the levels of public and political will for climate action at these sub-national levels. State and local surveys are costly and time-intensive, and as a result most public opinion polling is only done at the national level. This model for the first time reveals the full geographic diversity of public opinion in the United States at these critical levels of decision making. Global Warming will be harmful to future generations. Global Warming will effect me personally.